An old stone bridge spanning a fast moving stream in rural Iceland. An old bridge, grass, sky and flowing water. What more do you need for a great location for black and white landscape photography? The above image was made at ⅓ second at an aperture of f/13 and at a relatively wide-angle focal length of 32mm on my then Canon full frame camera. Made in the early hours of the morning, in rural Iceland, it was the light that caused me to pull the car over. An exploration followed to find suitable subject matter and a bit of scrambling was required to find a place from which to set up the camera. Once you're able to achieve well exposed and sharp images that displays acceptable levels of contrast and interesting subject matter it's time to begin to see what else about your best photos separates them from the rest. Images that connect with your audience, on a deeply emotional level, will be your most compelling photos. Other than that it's the underlying composition within the image that's likely to elicit positive responses from viewers. But it's not necessary to hit people over the head with striking images from the Book Of Composition written by Does Anyone Really Care. Composition in photography can be quite sublime and often works best when subtle, introduced more by suggestion compared to the more forthright approach taken by graphic designers creating logos and the like. 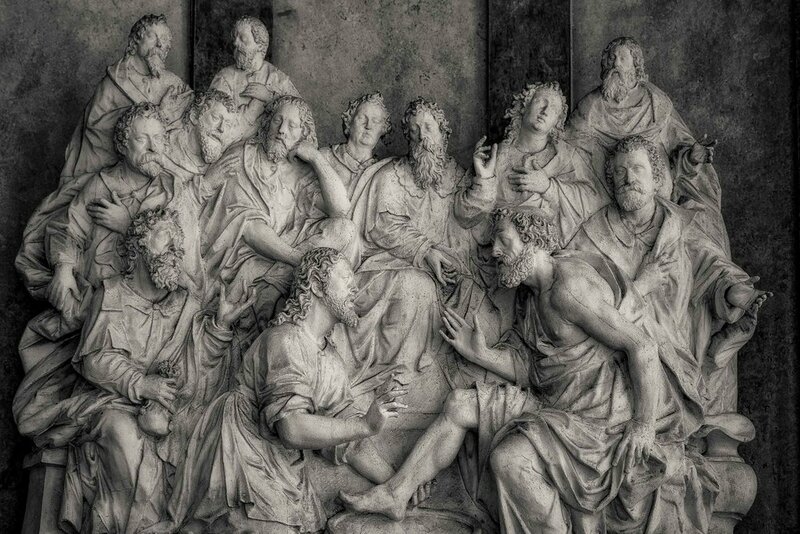 This statue of a group of civic leaders can be found in the grounds of St. Sebastian's Cemetery, Salzburg. Natural forms, man made structures and human gestures can all form composition elements within the photographic frame. Where your audience sees a family group the artist, amongst other things, sees harmony through a group of circles placed into a triangular shape. You can see this powerful technique illustrated in the above photo of a statue of civic leaders in the grounds of St. Sebastian's Cemetery in Salzburg, Austria. Look at how well the artist has grouped the faces (i.e., circle/oval shapes) into a series of triangles to explore personal interactions within the larger group. 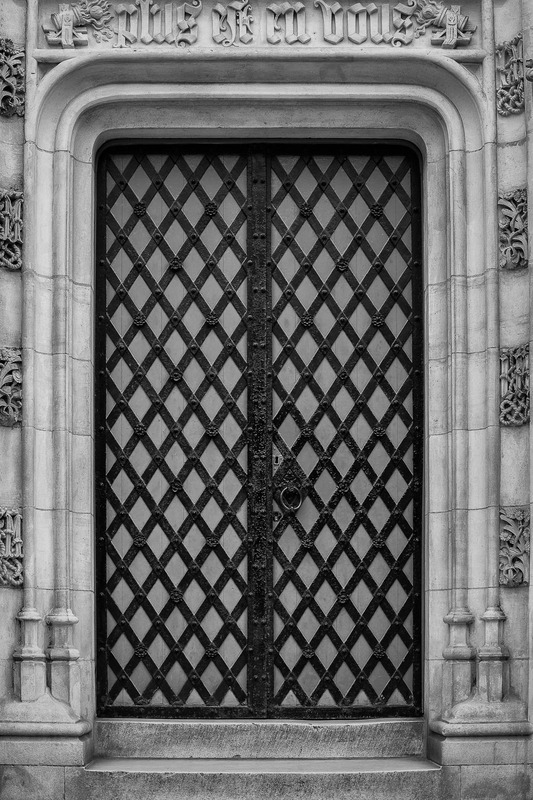 A metal and wood lattice door framed by stone speaks to the rich history of Bruges in Belgium. Likewise, an architectural photographer may respond to the order, balance, repetition and symmetry around which a public space, building facade or architectural detail has been designed. This close up image of a doorway in the historical town of Bruges is a great example of symmetry found within an element of a larger scene. I like the contrast between the softness of the moving water and the texture of the grasses and rocks in the photo at the top of this post. I love the stone bridge and remember finding the sweeping nature of its circular undercarriage to be particularly graceful. While the image consists of several interesting elements it's the juxtaposition between the smooth, flowing water and the stability of the old stone bridge that I find most interesting. To me, that's really what this photo is about. A dry, dirt road winds its way through beautiful mountain scenerey in rural Iceland. You really don't need much to make a good photograph. That is at least as far as subject matter is concerned. But then content goes beyond subject matter and I'm sure that intent, inspiration and experience are far more important to the artist within us all. I was driving through a landscape in Iceland that was totally new to me in an old camper van that leaked dust like the proverbial sieve. Almost as soon as I left the main highway it became obvious that the vehicle's suspension wasn't all that great. But I'm a careful driver and, though it's a long way around the island, I was in no rush. I'd left enough time in my itinerary for several excursions into the highlands. The variety of topography those side trips exposed me to provided lots of great photo opportunities that more than made up for any physical discomfort I experienced along the way. It was exciting passing through the valley pictured above. As the valley narrowed I saw my opportunity to stop the car and climb up onto the rocks on one side of the road. It provided a different outlook down onto the road and across to the mountain ridge in the background. I like how this unique perspective emphasizes the variations in green, throughout the scene, and the line the narrow dirt road cuts through the landscape. That line becomes a metaphor for the journey ahead. It's a three way relationship, and three is a holy number. Just ask the Minbari.